Hamptons Lane’s Coffee Quiz – What’s Your Style? If you enjoy regularly trying new coffees, but lack the time to search high and wide for new roasters, one option you have is to sign up for a coffee subscriptions service, and let someone else find the coffees for you. One relatively new company that provides this service is Hamptons Lane. * But how do the people at Hamptons Lane know which coffees to send you? When you first visit the company’s site, you are encouraged to take a short survey about what types of foods/beverages you like. Based on your answers, the company assigns you a profile and sends you a sampler box with four different coffees that it thinks you will like. 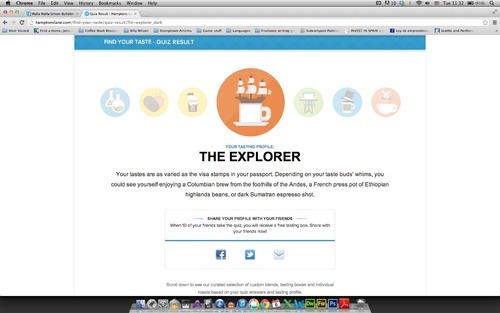 After the first month, you can continue to receive the samplers or pick the coffees you want, delivered to your door. I haven’t seen any Portland roasters on the site yet, but there are several from the West Coast. *I profiled another company that provides coffee subscriptions, Misto Box, several months ago. Since then, its owners went on ABC’s Shark Tank and received $75,000 from Mark Cuban to fund the company’s growth. It's a bit hard to find, but @nomadcoffeebcn is definitely worth seeking out. Thanks @pouredover, that Kenya was fantastic!